Drawing data from multiple sources, Un argues that following the 1993 United Nations intervention to promote democracy, the Cambodian People's Party (CPP) perpetuated a patronage state weak in administrative capacity but strong in coercive capacity. This enabled them to maintain the presence of electoral authoritarianism, but increased political awareness among the public, the rise in political activism among community-based organizations and a united opposition led to the emergence of a counter-movement. Sensing that this counter-movement might be unstoppable, the CPP has returned Cambodia to authoritarianism, a move made possible in part by China's pivot to Cambodia. Arnold, D. (2017). Civil Society, Political Society, and Politics of Disorder in Cambodia. Political Geography, (60): 23–33. Asia Foundation (2003). Democracy in Cambodia 2003: A Survey of the Cambodian Electorate. 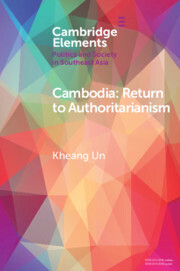 Available at: https://asiafoundation.org/resources/pdfs/DemocracyinCambodia.pdf (accessed April 1, 2018). Barber, J. and Chaumau, C. (1997). Slaughter on Sunday – March 30, 1997. The Phnom Penh Post, April 4–17. BBC World Service Trust (2010). Youth Civic Participation in Cambodia: Knowledge, Attitudes, Practices, and Media. Phnom Penh: United Nations Development Programme in Cambodia. Barney, K. (2005). “Customs, Concessionaires, Conflict: Tracking Cambodia’s Forest Commodity Chains and Export Links With China.” Forest Trends, 2005. Available at: www.foresttrends.org/documents/publications/Cambodia%20Report%20New.pdf (accessed April 30, 2009). Beban, A., So, S., and Un, K. (2017). From Force to Legitimation: Rethinking Land Grabs in Cambodia. Development and Change, 48(3), 590–612. Bessant, D. (2014). A Fistful of Donors. Southeast Asia Globe, 16 January. Available at: http://sea-globe.com/ngos-in-cambodia (accessed October 18, 2017). Bjornlund, E. (2001). Democracy Inc. The Wilson Quarterly, 25(3),18–24. Blanchard, B. (2018). China Says Foreigners Should Not Interfere in Cambodia after Election. Reuter, August 1. Available at: www.reuters.com/article/us-asean-singapore-china-cambodia/china-says-foreigners-should-not-interfere-in-cambodia-after-election-idUSKBN1KN034 (access August 9, 2018). Bopha, P. and Wallace, J. (2010). Businesses Tie Official Knot With Military. The Cambodia Daily, February 26. Bopha, P. and Wallace, J. The Cambodia Daily (2002). Hun Sen Says Khmer Rouge Trial “a Must.” June 3. Cambodia Development Resource Institute and Asian Development Bank (2000). Cambodia: Enhancing Governance for Sustainable Development, Final Report (Unedited Version). Presented to the Royal Government of Cambodia, Phnom Penh, April 2000. Phnom Penh: Asian Development-Cambodia. Cambodia Development Resource Institute (2018). A Survey of Cambodian Citizens on Family and Community Relations, Political Attitudes, Life Priorities, and Future Expectations. Phnom Penh: Cambodia Development Resource Institute. Center for Social Development (1998). National Survey on Public Attitudes Towards Corruption: Summery Report. Phnom Penh: Center for Social Development. Agency, Central Intelligence (n.d.). East and Southeast Asia: Cambodia. Available at: www.cia.gov/library/publications/the-world-factbook/geos/cb.html (accessed May 17, 2014). Chabal, P. and Daloz, J. P. (1999). Africa Works: Disorder as Political Instrument. Indiana: Indiana University Press. Chanda, N. (1986). Brother Enemy: The War after the War. New York: Harcourt. Chanda, N. (2002). China and Cambodia: In the Mirror of History. Asia Pacific Review 9(2),1–11. Chandler, D. (1998). The Burden of Cambodia’s Past. In Brown, F. Z. and Timberman, D. G., eds., Cambodia and the International Community: The Quest for Peace, Development, and Democracy. New York and Singapore: Asia Society and Institute of Southeast Asian Studies, pp. 33–48. Chandler, D. (2008). A History of Cambodia, 4th Edition. Boulder: Westview Press. Cheang, S. (2017). Envoy Who Cares about Workers in South Korea. Khmer Times, November 16. Available at: www.khmertimeskh.com/5090717/envoy-cares-workers-korea (accessed August 14, 2018). Chen, Daphne. (2017). Following US, EU Withdrawal of Funding, China to Donate Huge Load of Goods to NEC. Phnom Penh Post, December 29. Available at: www.phnompenhpost.com/national/following-us-eu-withdrawal-funding-china-donate-huge-load-goods-nec (accessed October 4, 2018). Clean Clothes Campaign (2015). Cambodian Trade Unions Sidelined in Preparation of Draft Trade Union Law. Available at: https://cleanclothes.org/news/2015/10/09/cambodia-trade-unions-sidelined-in-preparations-of-draft-trade-union-law (accessed September 12, 2018). Cochrane, L. (2007). Cambodia: Can’t See the Forest for the Thieves. World Politics Review, 06 June. Available at: www.worldpoliticsreview.com/article.aspx?id=829 (accessed September 15, 2018). COMFREL (2013). 2013 National Assembly Elections Final Assessment and Report. Available at: www.comfrel.org/eng/components/com_mypublications/files/781389Final_Report_and_Assessment_National_Assembly_Elections_Final_24_12_2013.pdf (accessed August 10, 2018). COMFREL (2017). Final Assessment and Report: the 2017 Commune Council Election. Available at: https://comfrel.org/english/final-assessment-and-report-the-2017-commune-council-eelection (accessed October 11, 2018). Constitution of the Kingdom of Cambodia (1993). Available at: www.wipo.int/edocs/lexdocs/laws/en/kh/kh009en.pdf. (accessed September 15, 2018). Cooperation Committee for Cambodia (2010). Reflections, Challenges, and Choices: 2010 Review of NGO Sector in Cambodia. Phnom Penh: Cooperation Committee for Cambodia. Cooperation Committee for Cambodia (2012). CSO Contributions to the Development of Cambodia 2012: Opportunities and Challenges. Available at: www.ccc-cambodia.org/backend/web/uploads/resource/media/CSO_Contributions_Report_2012_EN-58ba7ab272a44.pdf (accessed October 16, 2017). Croissant, A. (2016). Electoral Politics in Cambodia: Historical Trajectories, Current Challenges, and Comparative Perspectives. Konrad Adenauer Stiftung. Available at: www.kas.de/wf/doc/kas_46876–544-1–30.pdf?161102083353 (accessed October 7, 2017). Dapice, D. (2005). A SWOT Analysis of Cambodia. Phnom Penh: United Nations Development Programme. Diamond, L. (2002). Thinking About Hybrid Regimes. Journal of Democracy, 13(2), 21–35. Donovan, D. A. (1993). The Cambodian Legal System: An Overview. In Brown, F., ed., Rebuilding Cambodia: Human Resources, Human Rights, and Law. Washington: Foreign Policy Institute, Paul H. Nitze School of Advanced International Studies, John Hopkins University, pp. 60–107. Dreher, A., Fuchs, A., Parks, B. C., Strange, A. M., and Tierney, M. J. (2017). Aid, China, and Growth: Evidence from a New Global Development Finance Dataset. AidData Working Paper #46. Williamsburg, VA: AidData. Available at: www.aiddata.org/publications/aid-china-and-growth-evidence-from-a-new-global-development-finance-dataset (accessed September 13, 2018). Ebihara, M. (2018). Svay, A Khmer Village in Cambodia. Ithaca: Cornell University Press. Eisenstadt, S. and Roniger, L. (1984). Patrons, Clients and Friends: Interpersonal Relations and the Structure of Trust in Society. Cambridge University Press. Ellis-Petersen., H. (2018). No Cambodia Left: How Chinese Money is Changing Sihanoukville. The Guardian, 31 July. Available at: www.theguardian.com/cities/2018/jul/31/no-cambodia-left-chinese-money-changing-sihanoukville (accessed August 15, 2018). Eng, N. (2014). The Politics of Decentralisation in Cambodia: the District Level. PhD Dissertation, School of Politics and Social Inquiry, Monash University. Eng, N. and Ear, S. (2016). Decentralization Reforms in Cambodia. Journal of Southeast Asian Economies, 33(2), 209–223. Everett, S. and Meisburger, T. (2014). Democracy in Cambodia 2014: A Survey of the Cambodian Electorate. Phnom Penh: The Asia Foundation. Available at: https://asiafoundation.org/resources/pdfs/DemocracyinCambodia2014.pdf (accessed February 20, 2018). Extraordinary Chambers in the Courts of Cambodia. Available at: www.eccc.gov.kh/en/node/39457 (accessed October 10, 2018). Extraordinary Chambers in the Courts of Cambodia Far Eastern Economic Review (1993a). Bitter Victory: Poll Winners Find It Hard to Grasp Levers of Power. December 9. Extraordinary Chambers in the Courts of Cambodia (1993b). Concentrating the Mind. December 30. Extraordinary Chambers in the Courts of Cambodia (1994). Center Cannot Hold: Sihanouk Fears For the Future of His Country. May 19. Ford, M. and Gillan., M. (2017). In Search of a Living Wage in Southeast Asia. Employee Relations, 39(6), 903–914. Foreign Affairs Committee, the United States House of Representative (2018). Press Release: House Passes Cambodia Democracy Act. 25 July. Available at: https://foreignaffairs.house.gov/press-release/house-passes-cambodia-democracy-act (accessed August 15, 2018). Frieson, K. (1996). The Politics of Getting the Voter. In Heder, S. and Ledgerwood, J., eds., Propaganda, Politics and Violence in Cambodia: Democratic Transition under United Nations Peace-Keeping. Armonk: M.E. Sharpe, pp. 183–207. Fukuyama, F. (1989). The End of History? The National Interest, 16, 3–18. Global Witness. (1998). Country for Sale: How Cambodia’s Elite Has Captured the Country’s Extractive Industries. Available at: www.globalwitness.org/en/reports/country-sale (accessed October 15, 2017). Global Witness (2007). Cambodia’s Family Trees: Illegal Logging and the Stripping of Public Assets by Cambodia’s Elite. Available at: www.globalwitness.org/en/reports/cambodias-family-trees (accessed December 30, 2017). Global Witness (2013). Rubber Barons: How Vietnamese Companies and International Financiers Are Driving a Land Grabbing Crisis in Cambodia and Laos. Available at: www.globalwitness.org/sites/default/files/library/Rubber_Barons_lores_0.pdf (accessed December 20, 2018). Heder, S. (1995). Cambodia’s Democratic Transition to Neoauthoritarianism. Current History, 94, 425–429. Heder, S. (2005). Hun Sen’s Consolidation of Power: The Death or Beginning of Reform. Southeast Asian Affairs, 1, 111–130. Heder, S and Ledgerwood, J. eds. (1996). Propaganda, Politics and Violence: Democratic Transition under United Nations Peace-keeping. New York: ME Sharpe. Hideyuki, A. (2003). Cambodia General Election 2003: Report of International Observation Mission. Bangkok: Asian Network for Free Elections (ANFREL) and Asian Forum for Human Rights and Development. Holmes, O. (2017). “Death of Democracy” in Cambodia as Court Dissolves Opposition. The Guardian. Available at: www.theguardian.com/world/2017/nov/16/death-of-democracy-cambodia-court-dissolves-opposition-hun-sen (accessed February 3, 2018). Holmes, O. (2001). Mystics and Militants: Democratic Reform in Cambodia. International Politics, 38(1),47–64. Holmes, O. (2003). The Political Economy of Cambodia’s Transition, 1991–2001. Richmond: Routledge Curzon. Holmes, O. (2006). The Politics of Gifts: Tradition and Regimentation in Contemporary Cambodia. Journal of Southeast Asian Studies, 37(3), 469–489. Holmes, O. (2007). Transnational Networks, International Organizations and Political Participation in Cambodia: Human Rights, Labour Rights and Common Rights. Democratization, 14(5), 834–852. Holmes, O. (2009). Dependent Communities: Aid and Politics in Cambodia and East Timor. Ithaca: Cornell University Press. Holmes, O. (2013). “Understanding the Elections in Cambodia 2013,” AGLOS: Journal of Area- Based Global Studies. AGLOS Special Issue: Workshop and Symposium 2013–2014. Available at: http://dept.sophia.ac.jp/g/gs/wpcontent/uploads/2015/06/b98c8184d35f9b156df22f210dd322a2.pdf (accessed September 12, 2018). Hughes, C. and Real, S. (2000). Nature of Causes of Conflict Escalation in the 1998 National Election. Phnom Penh: Cambodian Development Resource Institute-Cambodian Center for Conflict Resolution. Hughes, C. and Un, K. (2007). Cambodia Country Governance Analysis. Phnom Penh: DFID, Embassy of the United Kingdom. Hughes, C. and Un, K., eds. (2011b). Cambodia’s Economic Transformation: Historical and Theoretical Frameworks. In Hughes, C. and Un, K., eds., Cambodia’s Economic Transformation. Copenhagen: Nordic Institute of Asian Studies, pp. 1–26. Human Rights Watch (2009). Cambodia: 1997 Grenade Attack on Opposition Still Unpunished: Suspects in Attack Have Been Promoted Instead of Prosecuted. Available at: www.hrw.org/news/2009/03/30/cambodia-1997-grenade-attack-opposition-still-unpunished (accessed September 2, 2015). Hun Sen, Facebook (accessed August10, 2018). Huntington, S. (1996). Political Order in Changing Societies. New Haven: Yale University Press. International Center for Non-Profit Law (2018). Civic Monitor: Cambodia. Available at: www.icnl.org/research/monitor/cambodia.html (accessed October 11, 2018). International Republican Institute (IRI). Survey of Cambodian Public Opinion 2007, 2009, 2010, 2011, 2012, 2013, 2014. Available at: www.iri.org/news-and-resource?type=1&country=670 (accessed January 10, 2018). Kato, T. (2000). Cambodia Enhancing Governance for Sustainable Development. Phnom Penh: Asian Development Bank and Cambodian Development Resource Institute. Kaufmann, D. and Kraay, A. (2016). Worldwide Governance Indicators. World Bank. Available from: http://info.worldbank.org/governance/wgi/#home (accessed December 26, 2017). Khy, S. (2017). Court “Must Solve” Corruption Conundrum. The Cambodia Daily, 20 June. Kiernan, B. (2002). The Pol Pot Regime: Race, Power, and Genocide in Cambodia Under the Khmer Rouge, 1975–1979. Yale University Press. Kyne, P. (1999). Cambodia’s Kingdom of Corruption: the High Cost of Doing Business. The Phnom Penh Post, June 25–July 8. Kynge, J., Haddou, L., and Peel., M. (2016). FT Investigation: How China Bought its Way into Cambodia. Financial Times, September 8. Available at: www.ft.com/content/23968248-43a0-11e6-b22f-79eb4891c97d (accessed April 26, 2018). Lang, R. (1996). Trade Status Herald New Age in Cambodia-US Ties. The Phnom Penh Post, October 4. Available at: www.phnompenhpost.com/national/trade-status-heralds-new-age-cambodia-us-ties (accessed September 12, 2018). Lao, M. H. (1998). Cambodia’s Agonizing Quest: Political Progress amid Institutional Backwardness. In Hendrickson, D., ed., Safeguarding Peace: Cambodia’s Constitutional Challenge. London: Conciliation Resources, pp. 36–42. Lao, M. H (2006). “Institutions for the Rule of Law and Human Rights in Cambodia.” Available at: http://alrc.asia/article2/2006/02/institutions-for-the-rule-of-law-and-human-rights-in-cambodia (accessed September 07, 2018). Laws Associations and Non-governmental Organizations (Unofficial Translation by OHCHR of the Law Approved by National Assembly on July 13, 2015). Available at: http://cambodia.ohchr.org/~cambodiaohchr/sites/default/files/Unofficial_Translation_of_5th_LANGO_ENG.pdf (accessed April 1, 2018). Le Billon, P. (2002). Logging in Muddy Waters: The Politics of Forest Exploitation in Cambodia. Critical Asian Studies, 34(4), 563–586. Ledgerwood, J. and Un, K. (2003). Global Concepts and Local Meaning: Human Rights and Buddhism in Cambodia. Journal of Human Rights, 2(4), 531–549. Leifer, M. (1968). The Failure of Political Institutionalization in Cambodia. Modern Asian Studies, 2(2), 125–140. Lemarchand, R. (1988). The State, the Parallel Economy and the Changing Structure of Patronage Politics. In Rothchild, D. and Chazan, N., eds., The Precarious Balance: State and Society in Africa. Boulder: Westview Press, pp. 150–157. Levitsky, S. and Way, L. (2010). Competitive Authoritarianism: Hybrid Regimes after the Cold War. New York: Cambridge University Press. Lewis, S. (2012). “Japan Adds to Criticism of Cambodia’s Role as ASEAN Chair”, Cambodia Daily, September 9. Lewis, S. and Kuch, N. (2013). Constitutional Council Pivotal in Election Stalemate, The Cambodia Daily, 7 August. Available at: www.cambodiadaily.com/elections/constitutional-council-pivotal-in-election-stalemate-38528 (accessed December 29, 2017). LICADO (2014). Statement: 2014 Brings a New Wave of Cambodian Land Conflicts. Available at: www.licadho-cambodia.org/pressrelease.php?perm=342 (accessed August 22, 2018). Lum, T., Morrison, W., and Vaughn., B. (2008). China’s “Soft Power” in Southeast Asia. CRS Report for Congress, June. Available at: www.fas.org/sgp/crs/row/RL34310.pdf (accessed March 20, 2009). Marks, P. (2000). China’s Cambodia Strategy. Parameters Online, Autumn 2000. Available at: www.sophanseng.info/wp-content/uploads/2015/05/Chinas-Cambodia-Strategy.pdf (accessed October 4, 2018). May, T. (2014). Kings of Concessions. The Phnom Penh Post, February 25. Available at: www.phnompenhpost.com/national/kings-concessions (accessed October 4, 2014). May, T. (2017). China Agenda Fuels “Treason” Plot Support. Khmer Times, September 8. Available at: www.khmertimeskh.com/5082099/china-agenda-fuels-treason-plot-support (accessed September 9, 2017). McCarthy, S. and Un, K. (2017). The Evolution of Rule of Law in Cambodia. Democratization, 24(1): 100–118. McLeod, R. (2000). Soeharto’s Indonesia: A Better Class of Corruption. Agenda 7(2), 99–112. Meach, D. and Turton, S. (2017). Third Member of PM’s Bodyguard Unit Seen Kicking head of MP Promoted. The Phnom Penh Post, January 26. Meas, S. and Handley, E. (2017). CPP Amends Party Law, Opening Door to Dissolving Opposition. The Phnom Penh Post, February 21. Available at: www.phnompenhpost.com/national/cpp-amends-party-law-opening-door-dissolving-opposition (accessed February 3, 2018). Mech, D. (2017). Generals Added Amid Political Crackdown. The Phnom Penh Post, November 27. Meta, K., (2018). Migrants Face Thai Deadline. The Phnom Penh Post, June 20. Available at: www.phnompenhpost.com/national/migrants-face-thai-deadline (accessed October 11, 2018). Middleton, C. (2008). Cambodia’s Hydropower Development and China’s Involvement. Berkeley: International Rivers. Ministry of Foreign Affairs of the People’s Republic of China (2017). Foreign Ministry Spokesperson Geng Shuang’s Regular Press Conference on September 4, 2017. Available at: www.fmprc.gov.cn/mfa_eng/xwfw_665399/s2510_665401/t1489891.shtml (accessed October 11, 2018). Mogato, M., Marina, M., and Blanchard, S. (2016). ASEAN Deadlocked on South China Sea: Cambodia Blocks Statement. Available at: www.reuters.com/article/us-southchinasea-ruling-asean/asean-deadlocked-on-south-china-sea-cambodia-blocks-statement-idUSKCN1050F6 (accessed September 15, 2018). Morgenbesser, L. (2017). Misclassification on the Mekong: the Origins of Hun Sen’s Personalist Dictatorship,” Democratization, 25(2), 191–208. Kuch, N. and Seiff, A. (2012). Adhoc Rights Workers Charged with Aiding Perpetrator, The Cambodia Daily, August 15. National Committee for Sub-national Democratic Development (2014). Is Governance Improving? A Comparison of the Results of the 2011 and 2013 IP3 Governance Perception Survey. April 6. Phnom Penh: Ministry of Interior. National Election Committee (NEC) (2018). News Release on the Preliminary Results of the Parliamentary Elections July 29, 2018. Available at: www.necelect.org.kh/khmer/content/3463 (accessed August 10, 2018). Nohlen, D., Grotz, F., and Hartmann, C. (2001). Elections in Asia: A Data Handbook, Volume II. Oxford University Press. Norén-Nilsson, A. (2016a). Cambodia’s Second Kingdom: Nation, Imagination, and Democracy Ithaca: Southeast Asia Program, Cornell University. Norén-Nilsson, A. (2016b). Good Gifts, Bad Gifts, and Rights: Cambodian Popular Perceptions and the 2013 Elections. Pacific Affairs, 89(4), 795–815. Nuon, V. and Serrano, M. (2010). Building Unions in Cambodia: History, Challenges and Strategies. Friedrich Ebert Stiftung. Available at: http://library.fes.de/pdf-files/bueros/singapur/07907.pdf (accessed August 10, 2018). O’Donnell, G. (2004). Why the Rules of Law Matters. Journal of Democracy, 15(2), 32–46. Ojendal, J. (2013). In Search of a Civil Society: A Negotiating State-Society Relations in Cambodia. In Waibel, G., Ehlert, J., and Feuer, H. N., eds., Southeast Asia and the Civil Society Gaze: Scoping a Contested Concept in Cambodia and Vietnam. Vol. 4. New York: Routledge, pp, 21–38. Osborne, M. E. (1994). Sihanouk: Prince of Light, Prince of Darkness. Honolulu: University of Hawaii Press. Ou, K. and Chheat, S. (2017). Feasibility Study on Civil Society Fund (CSF) in Cambodia. Phnom Penh: Committee for Cooperation Cambodia. Ou, S. and Kim, S. (2013). 20 Years’ Strengthening of Cambodian Civil Society: Time for Reflection. Working Paper Series No. 85. Phnom Penh: Cambodia Development Research Institute. PACT-Cambodia (2010). Corruption and Cambodian Households. Available at: www.pactcambodia.org/Publications/Anti_Corruption/Corruption&;Cambodian%20Households%202010%20Eng.pdf (accessed September 15, 2018). Pak, K. and Craig, D. (2011). Learning from Party Financing of Local Investment Projects in Cambodia: Elite and Mass Patronage, Accountability and Decentralized Governance. In Hughes, C. and Un, K., eds., Reform and Transformation in Cambodia. Copenhagen: NIAS, pp, 219–249. Parameswaran, P. (2018). China-Cambodia Defense Ties in the Spotlight with Military Drills. The Diplomat, March 21. Available at: https://thediplomat.com/2018/03/china-cambodia-defense-ties-in-the-spotlight-with-military-drills (accessed April 26, 2018). Peou, S. (1998). Cambodia in 1997: Back to Square One? Asian Survey, 38(1), 69–74. Peou, S. (2001a). Pre-emptive Coup: Causes and Consequences. In Peou, S., ed., Cambodia: Change and Continuity in Contemporary Politics. Singapore: Ashgate, pp. 86–102. Peou, S. (2001b). Cambodia after the Killing Fields. In Funston, J., ed., Government and Politics in Southeast Asia. Singapore: Institute of Southeast Asian Studies, pp, 36–73. Phong, K., Srun, L., and Sola, J. (2016).Mobile Phones and Internet Use in Cambodia 2016. Phnom Penh:Asia Foundation. Available at: https://asiafoundation.org/publication/mobile-phones-internet-use-cambodia-2016 (accessed February 3, 2018). Phorn, B., and Wallace, J. (2010). Businesses Tie Official Knot with Military. The Cambodia Daily, February 26. Ponniah, K. (2013). Political Eyes on Youth Voting. The Phnom Penh Post, July 9. Available at: www.phnompenhpost.com/national/political-eyes-youth-vote (accessed September 12, 2018). Putnam, R., Leonardi, R. and Nanetti, R. Y. (1994). Making Democracy Work: Civic Traditions in Modern Italy. Princeton University Press. Press OCM (2017). Did Color Revolution Modelling on Color Revolutions In Other Countries Around the World Really Happen in Cambodia. Phnom Penh: Royal Government of Cambodia. Available at: www.youtube.com/watch?v=3PU2RHBEQK8 (accessed October 4, 2018). Radio Free Asia (2014). Cambodian PM Promotes 29 to Four Star General. Available at: www.rfa.org/english/news/cambodia/promotion-02052014165509.html (accessed September 2, 2015). Radio Free Asia (2015). Cambodia’s Armed Forces “Belong” to the Ruling Party. July 29. Available at: www.rfa.org/english/news/cambodia/military-07292015145855.html (accessed September 2, 2015). Radio Free Asia (2018). Cambodia Investigating Former Opposition Members Over Election Boycott Campaign. July 23. Available at: www.rfa.org/english/news/cambodia/investigation-07232018165842.html (accessed August 15, 2018). Reuters, , (2018). Japan, Cambodia Sign $90 Million Aid Agreement, April 8. Available at: www.reuters.com/article/us-cambodia-japan/japan-cambodia-sign-90-million-aid-agreement-idUSKBN1HF062 (access April 29, 2018). Rollet, C. and Baliga, A. (2015). Too Many Unions: Owners. The Phnom Penh Post, September 3. Available at: www.phnompenhpost.com/business/too-many-unions-owners (accessed October 6, 2018). Rik, Roum (pseud.) (2003). On Behalf of the Pagoda Boys’ Association Phnom Penh. Phnom Penh Post, May 9. Rusten, C., Kim, S., Eng, N., and Pak, K. (2004). The Challenges of Decentralisation Design in Cambodia. Phnom Penh: Cambodia Development Resource Institute. Salamon, L. M. (1994). The Rise of the Nonprofit Sector. Foreign Affairs 73 (July/August), 109–122. Schedler, A. ed. (2006). Electoral Authoritarianism: The Dynamics of Unfree Competition. Boulder: Rienner. Shawcross, W. (1981). Sideshow: Kissinger, Nixon, and the Destruction of Cambodia. New York: Simon & Schuster. Shawcross, W. (1994). Cambodia’s New Deal. Washington, D.C.: Carnegie Endowment for International Peace. Sidel, J. (1997). Philippine Politics in Town, District, and Province: Bossism in Cavite and Cebu. The Journal of Asian Studies, 56(4), 947–966. Sloth, C., Khlok, B., and Heov, K. S. (2005). Non-Timber Forest Products: Their Values to Rural Livelihood. Cambodia Development Review, 9(4), 1–5. SPK (1993). Statement of the His Excellency Hun Sen to Fellow Citizens. June 13. (Author’s Translation). Spiess, R. (2018). A Sector Too Big To Fail? Phnom Penh Post, 5 April. Available at: www.phnompenhpost.com/business/sector-too-big-fail (accessed August 18, 2018). Stokes, S. (2005). Perverse Accountability: A Formal Model of Machine Politics with Evidence from Argentina. American Political Science Review, 99(3), 315–325. Stokes, S. The Economist (2017). “The Giant’s Client: Why Cambodia Has Cosied up To China. January 17. Available at: www.economist.com/news/asia/21715010-and-why-it-worries-cambodias-neighbours-why-cambodia-has-cosied-up-china (accessed April 1, 2018). Stokes, S. The Phnom Penh Post Staff (2007). Son Soubert Still Serving after 30 Years. The Phnom Penh Post, November 16–29. Available at: www.phnompenhpost.com/national/son-soubert-still-serving-after-30-years (accessed October 10, 2018). Thun, V. (2014). Youth Political Participation in Cambodia: Role of Information and Communication Technologies (ICTs). Master Thesis, Northern Illinois University. Transparency International (2007). Global Corruption Report 2007: Corruption in Judicial Systems. Cambridge University Press. Un, K. (2005). Patronage Politics and Hybrid Democracy: Political Change in Cambodia, 1993–2003. Asian Perspective, 29(2), 203–230. Un, K. (2006). State, Society and Democratic Consolidation: The Case of Cambodia. Pacific Affairs, 79(2), 225–245. Un, K. (2008a). Cambodia’s 2008 Parliamentary Elections: Prospects for Opposition Politics. AsiaPacific Bulletin, East-West Center. Available at: www.eastwestcenter.org/publications/cambodias-2008-parliamentary-elections-prospects-opposition-politics (accessed October 4, 2018). Un, K. (2008b). Sam Rainsy and the Sam Rainsy Party: Configuring Opposition Politics in Cambodia. In Kane, J., Patapan, H., and Wong, B., eds., Dissident Democrats. The Challenge of Democratic Leadership in Asia. Palgrave Macmillan, pp. 105–128. Un, K. (2009). The Judicial System and Democratization in Post-Conflict Cambodia. In Ojendal, Joakim and Mona, Lilja, eds., Beyond Democracy in Cambodia: Political Reconstruction in a Post-Conflict Society. Copenhagen: NIAS, pp. 70–100. Un, K. (2011). Cambodia: Moving Away from Democracy? International Political Science Review, 32(5), 546–562. Un, K. (2013a). Cambodia in 2012: Beyond the Crossroads? Asian Survey, 53(1), 142–149. Un, K. (2013b). The Cambodian People Have Spoken. The New York Times. Available at: www.nytimes.com/2013/08/10/opinion/global/the-cambodian-people-have-spoken.html (accessed February 3, 2018). Un, K. (2015). The Cambodian People Have Spoken: Has the Cambodian People’s Party Heard? In Sigh, Dajit, ed., Southeast Asian Affairs. Institute of Southeast Asian Affairs, pp. 102–116. Un, K., and Ledgerwood, J. (2003). Cambodia in 2002: Decentralization and its Effects on Party Politics. Asian Survey, 43(1), 113–119. Un, K. and So, S. (2011). Land rights in Cambodia: How Neopatrimonial Politics Restricts Land Policy Reform. Pacific Affairs, 84(2), 289–308. UNHCHR (2007). Economic Land Concession for Economic Purposes in Cambodia: A Human Right Perspective. Phnom Penh: United Nations Cambodia Office of the High Commissioner for Human Rights. Verkoren, W. and Ngin, C. (2017). Organizing against Land Grabbing in Cambodia: Exploring Missing Links. Development and Change, 48(6), 1336–1361. Vickery, M. (1986). Kampuchea: Politics, Economics, and Society. Boulder: Lynne Reinner. Vickery, M. (1994). The Cambodian People’s Party: Where Has It Come From, Where Is It Going? Southeast Asian Affairs, 102–117. White, G. (1994). Civil Society, Democratization and Development (I): Clearing the Analytical Ground. Democratization, 1(2), 375–390. Williams, S. (1999). Review of Land Issues Literature. Phnom Penh: Oxfam. Working Group for an ASEAN Human Rights Mechanism (2007). Report on the Arrest of Kem Sokha and Other Public Figures. Available at: www.aseanhrmech.org/nwgs/cambodia/report-on-the-arrest-of-kem-sokha.html (accessed September 23, 2018). World Bank (2003a). Cambodia: Enhancing Service Delivery Through Improved Resource Allocation and Institutional Reform. Report No. 25611-KH. World Bank (2006a). Cambodia Halving Poverty by 2015: Poverty Assessment 2006. Cambodia World Bank Newsletter, 4(3), 1–4. World Bank (2007). Cambodia Sharing Growth: Equity and Development in Cambodia Equity Report 2007. Report No. 39809-KH. World Bank (2016). Country Highlights: Cambodia 2016. Available at: www.enterprisesurveys.org/~/media/GIAWB/EnterpriseSurveys/Documents/CountryHighlights/Cambodia-2016.pdf (accessed September 15, 2018). World Bank (2017a). Net ODA Received (% of GNI). Available at: https://data.worldbank.org/indicator/DT.ODA.ODAT.GN.ZS (accessed December 25, 2017). World Bank (2017b). Net Official Development Assistance Received (Current US$). Available at: https://data.worldbank.org/indicator/DT.ODA.ODAT.CD (accessed December 25, 2018). Bank, World (2018). Data. Available at: https://data.worldbank.org/indicator (accessed August 18, 2018). D1, interview with author, Phnom Penh, July 10, 2003. D7, interview with author, Phnom Penh, August 2, 2011. D3, interview with author, Phnom Penh, October 10, 2014. D4, interview with author, Phnom Penh, July 14, 2018. G12, interview with author, Phnom Penh, August 1, 2013. G20, interview with author, Phnom Penh, June 27, 2017. Steve Heder, interview with author, Phnom Penh, July 26, 2017. Soksan Hing, interview with author, Phnom Penh, June 20, 2014. J23, interview with author, Phnom Penh, September 25, 2002. J32, interview with author, Phnom Penh, June 20, 2001. Khieu Khannariddh, Minister of the Ministry of Information, interview with the author, Phnom Penh, June 16, 2005. N2, interview with author, Phnom Penh, May 25, 2003; July 9, 2017; July 19, 2017. N3, interview with author, Phnom Penh, January 15, 2003. N6, interview with author, Phnom Penh, January 20, 2003; July 4, 2017. N7, personal communication, September 5, 2018. N14, interview with author, Phnom Penh, January 8, 2003; January 8, 2013. N39, interview with author, Phnom Penh, June 18, 2013; July 4, 2017; July 10, 2017. N40, interview with author, Phnom Penh, July 18, 2017. Sothirak Pou, Executive Director, Cambodia Institute for Peace and Cooperation, Former Secretary of State, Ministry of International Affairs and Cooperation, and former Cambodian Ambassador to Japan, interview with author, July 23, 2018. Preap Kol, Executive Director, Transparency International Cambodia, interview with author, August 2, 2017.